If you have attended an EDAX EBSD training course, you have seen the following slide in the Pattern Indexing lecture. 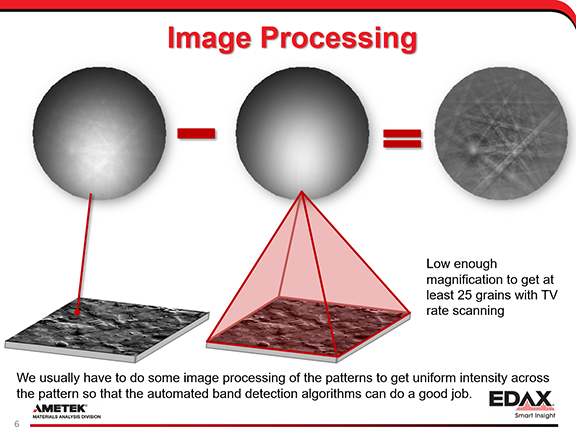 This slide attempts to explain how to collect a background pattern before performing an OIM scan. The slide recommends that the background come from an area containing at least 25 grains. Those of you who have performed re-indexing of a scan with saved patterns in OIM Analysis 8.1 may have noticed that there is a background pattern for the scan data (as well as one of the partitions). This can be useful if re-indexing a scan where the raw patterns were saved as opposed to background corrected patterns. This background pattern is formed by averaging 500 patterns randomly selected from the saved patterns. 500 is a lot more than the minimum of 25 recommended in the slide from the training lecture. Recently, I was thinking about these two numbers – is 25 really enough, is 500 overkill? With some of the new tools (Callahan, P.G. and De Graef, M., 2013. Dynamical electron backscatter diffraction patterns. Part I: Pattern simulations. Microscopy and Microanalysis, 19(5), pp.1255-1265.) 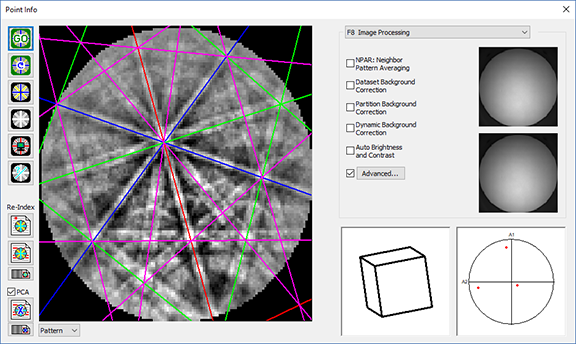 available for simulating EBSD patterns I realized this might be provide a controlled way to perhaps refine the number of orientations that need to be sampled for a good background. To this end, I created a set of simulated patterns for nickel randomly sampled from orientation space. The set contained 6,656 patterns. If you average all these patterns together you get the pattern at left in the following row of three patterns. 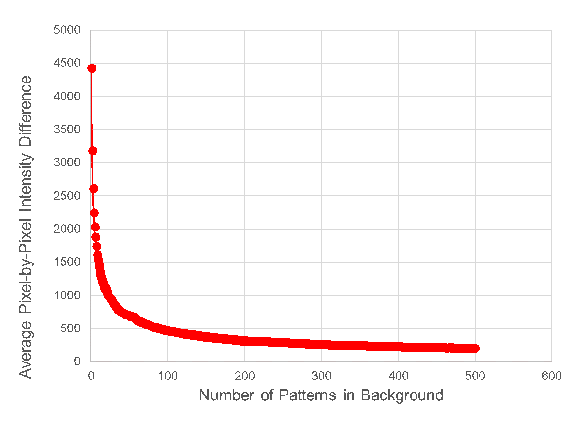 The average patterns for 500 and 25 random patterns are also shown. The average pattern for 25 random orientations is not as smooth as I would have assumed but the one with 500 looks quite good. From this curve, my intuitive estimate that 25 grains is enough for a good background appears be a bit optimistic., but 500 looks good. There are a few caveats to this, the examples I am showing here are at 480 x 480 pixels which is much more than would be used for typical EBSD scans. In addition, the simulated patterns I used are sharper and have better signal-to-noise ratios than we are able to achieve in experimental patterns at typical exposure times. These effects are likely to lead to more smoothing. I recently saw Shawn Bradley who is one of the tallest players to have played in the NBA, he is 7’6” (229cm) tall. I recognized him because he was surrounded by a crowd of kids – you can imagine that he really stood out! This reminded me that these results assume a uniform grain size. If you have 499 tiny grains encircling one giant grain, then the background from these 500 grains will not work as a background as it would be dominated by the Shawn Bradley grain! ← One Analysis Technique – So Many Options! Very interesting work! What happens in OIM-DC when a background is collected? Is that background also made of 500 random patterns? Are they simply summed up to make the background pattern? (2) The scanning rate of the beam and the number of grains in the field of view. So consider the following example. Let’s say we have set up the camera so that it is collecting patterns at a rate of 321 frames a second. Le’t set the number of frames for background collection to 25. Then the background would be acquired in 25/321 = 0.078 seconds Now, let’s assume the SEM scans the field of view in 1 second and that the field of view contains 1000 grains. Then if our time interval is 0.078 seconds then we would scan approximately 8% of the grains in the field of view and thus only 80 grains will have been sampled. In this example, it would actually make sense to sample all 1000 grains in the field of views so we would want to set the number of frames for the background to 321.